Bears Mailbag - What Happened Against The Packers' Zone Coverages? Bears Mailbag – What Happened Against The Packers’ Zone Coverages? Welcome to this week’s Chicago Bears Mailbag! Usually I start with a lengthy preamble, but I have no desire to rehash the Bears’ heartbreaking, yet encouraging, Week 1 loss to the Green Bay Packers. All we can do is look forward to seeing how they bounce back in Week 2 in their home opener on Monday Night Football against the Seattle Seahawks. So let’s dive into this week’s Mailbag. Thanks to everyone who submitted questions! I always appreciate the participation. And if you’re interested in continuing the discussion, follow/reach out to me on Twitter @DhruvKoul. How was mitch not prepared for zone blitzes? Doesnt practicing against vic fangio help in this department? How can matt nagy not expect any zone all day? They said they expected only man? Im worried, zone is where mitch struggled in college. He looked shook vs it on SnF. This was one of the biggest things that concerned me from the game. After the Bears came out to a roaring start on their first two drives, scoring a touchdown on one and barely missing one on the next, the Packers adjusted and switched from man concepts to zone concepts. 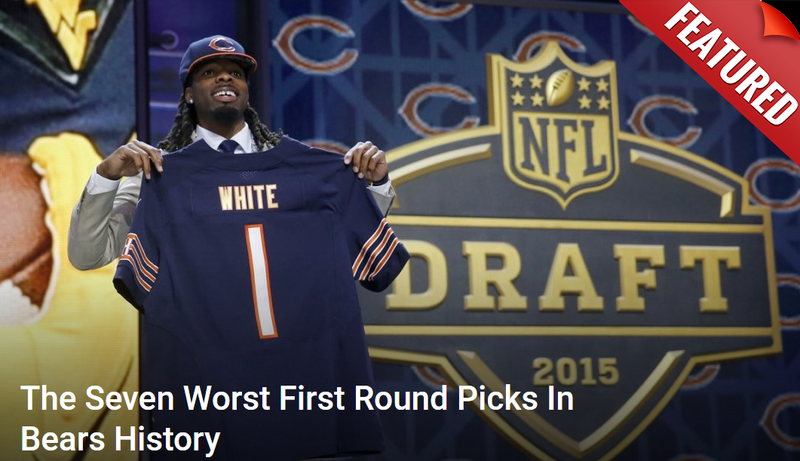 For whatever reason, the Bears never adjusted themselves, and they lost. I absolutely place a lot of this blame on Matt Nagy. He should have seen that Green Bay switched up what they were doing on defense — why didn’t his play calls have adjustments or route combinations that could beat zone coverages? In training camp, Nagy said that there was an answer for everything in each play of his. Well, the most egregious example came on a 4th and 1, when Mitch Trubisky rolled right on play action and then threw back to Dion Sims on a drag route (a route Sims ran short of the sticks, by the way). The most incredible part of this was that Sims was the ONLY option on the play, and the play was ONLY designed to beat man coverage. That’s truly unacceptable from a coaching perspective. What I don’t know is what Trubisky was allowed to do at the line of scrimmage. I have a hard time believing he couldn’t identify the defensive coverage — after all, he stated after the game that the Packers switched to zone and that they basically didn’t have any answers for it in the play calls. What were his audible permissions? If he had any, was he just bad at calling audibles? It’s hard to say. What I do know is that both Nagy and Trubisky have to be many orders of magnitude better on Monday night against Seattle, and beyond, if they’re to have the type of success that everybody’s hoping for. OLB was identified as the most urgent need and it was addressed (emphatically)! Has the secondary been exposed as the new biggest weakness on the roster? The Bears’ secondary got torched in the second half against Aaron Rodgers — there’s no doubt about it. Kyle Fuller didn’t play well and dropped the easiest possible INT of his entire career that would have sealed the win. Prince Amukamara looked slow and got destroyed by Davante Adams, especially on YAC. Early on, it wasn’t bad. Plenty was going right for the Bears’ defense, thanks mostly to their pass rush that ate up the Packers’ offensive line and swallowed Aaron Rodgers and DeShone Kizer whole. In the second half, especially after Rodgers’s injury, they adjusted to quick throws to neutralize the pass rush. Green Bay’s receivers had a field day with YAC, and it doesn’t help that the Bears’ corners played off man coverage a lot. Plus, their tackling was subpar in the second half. Everything went wrong in the second half, and it was especially magnified because the offense shut down in the second half as well. The Bears really should have played a bit more press coverage to disrupt Rodgers’s timing on the quick throws and allowed the pass rush a bit more time to get to the quarterback. I don’t think the secondary is good enough to win without pass rush every game, though they also won’t be facing a quarterback of Aaron Rodgers’s caliber every game, either. That said, the secondary, especially the corners, do need some help. Fuller is a very good corner who just didn’t play well, but Amukamara’s play did spring some concern. Let’s hope Eddie Jackson has more opportunities, and is able, to make plays on the ball. He didn’t have many, if any, in the opener. Jackson needs to turn into the ball-hawking center fielder the Bears hope he can be for this defense to become as dangerous as we expect with the addition of Khalil Mack and Roquan Smith. Will we be seeing Trubisky taking more shots downfield to Gabriel and Miller? I do think that we will. Matt Nagy said that he wasn’t a fan of calling too many screens throughout the game, especially in the second half — and they threw a RIDICULOUS number of screens and swing passes. The entire passing attack became horizontal, and that won’t work against zone defense, which the Packers played much of the second half. In all, the Bears took four shots basically the entire game down the field before the final drive, and that’s when the defense was expecting desperation out of a young quarterback. The Bears have to do a better job using their ground game (they didn’t run nearly enough in the game) and going to play action and taking shots down the field. That approach is something Trubisky is very comfortable with, and has had success with in the past. Nagy, if he’s as creative and brilliant offensively as they say, will incorporate more of those concepts and put Trubisky in a better spot to succeed. Nagy does deserve criticism for his play calling. See my explanation above regarding not calling any plays to beat zone coverage, or not having inbuilt options for Trubisky to execute to beat zone coverage, which the Packers played much of the second half. And I would expect Seattle to see that tape and play zone a lot on Monday night. Trubisky missed some throws — there’s no doubt about it. He missed Robinson in the end zone on the second drive, and missed Tarik Cohen on the wheel route in the end zone that you referenced as well. Those were crucial misses. But he did make some plays on the second-to-last drive as well, that gave the Bears a chance to ice the game. Picking up a first down with his legs on a QB sweep was one. Escaping the pocket with his eyes downfield and finding Anthony Miller on a third down was another. He made some good plays, just not nearly enough of them. He needs to be better — and that starts Monday night.